Restoration work on the Gilman Chapel is scheduled to begin on April 23rd, 2018. The Trustees have contracted Capital Construction Contracting, Inc., a Dorchester company, to begin the initial phase of the work. 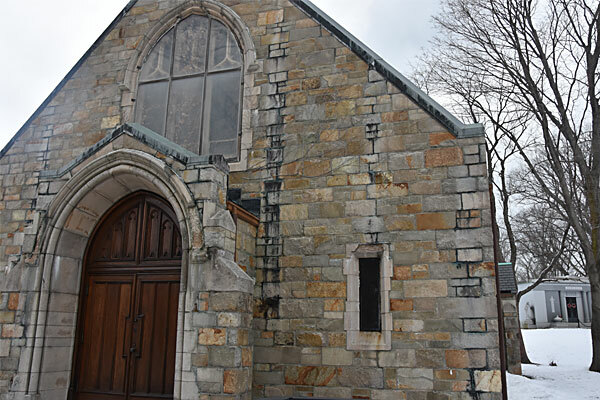 Anyone interested in learning more about this project or in contributing to the Gilman Chapel Restoration Fund is encouraged to call the cemetery office at 617-825-1360. As we have more news about the Fund, we will provide that information. A recent article about the restoration project appeared in the Dorchester Reporter on March 29th, 2018. Photographs reveal the extent of water damage that has occurred over time as well as the extent of the need for repairs to the chapel, both exterior and interior.